When it comes to opening those bottle requiring a bottle opener. But no worries, you can still use the wall mounted bottle opener if your bottles are twist off. The opener lets you open the bottle with one hand, and with the catcher right below (about 7 inches), the caps will fall right in without having to worry about clean up. The cap is wide enough for you to reach in and pull out the caps the next morning, or if clean up is due that night, just left the catcher up and out to go take the caps to the trash. The catcher should be able to hold one night's worth of bottle caps (estimated at 75 caps), unless you got a big party going on. Either way, clean up is fast and easy! The catcher is also nice for the people that like to keep the caps. This will save you the time and hassle of digging through the trash to get them. • We offer a 100%, no questions asked, Money Back Guarantee. Modern: The opener has the words and logo of "Beer Thirty" on it while the catcher looks modern and sleek. They look great together!!! Your friends and family will know what time it is when opening their next bottle. 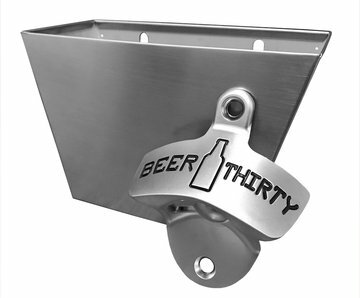 MODERN & DURABLE: The opener has Nickel Matted finish to give it a modern design and is built well while telling you it's "Beer Thirty". The cap catcher is brushed stainless steel.